Our proprietor, Phil Weaver, is currently offering several Power Point presentations on research projects he is involved with. They are being made available for the general public, historic/civic organizations, and other interested audiences. (An appropriate honoraria is customary.) However, as Mr. Weaver's schedule is rather busy, they are only available on a limited basis at this time. This linear presentation begins with a general overview of the formation of the 2nd New York Battalion (and its predecessor companies) that occurred following the capture of Fort Ticonderoga in May of 1775. Divided into three distinct parts, the first will focus on the formation of the Battalion and the geographic recruiting that occurred in upstate New York. 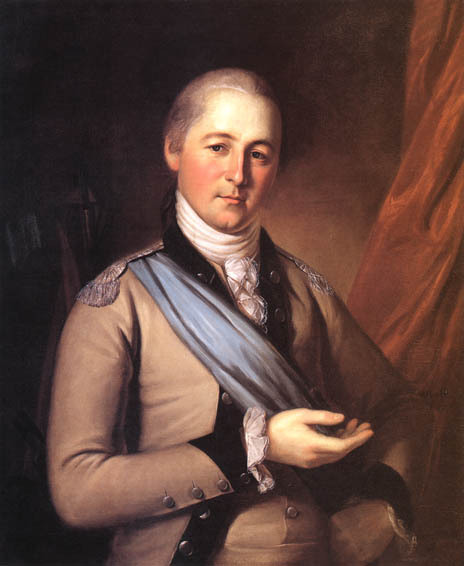 The second portion lightly touches on the campaign from Fort Ticonderoga to the Capture of Montreal. The final portion addresses the selection of picked men from the 2nd New York as part of General Montgomery’s advance force and that force’s participation in the assault on Quebec City on December 31, 1775. Specifics about the assault will incorporate the presenter’s new research, to date, on what actually happened during the assault. The program will be supported by rarely seen depositions and correspondence from both the officers and men who served. 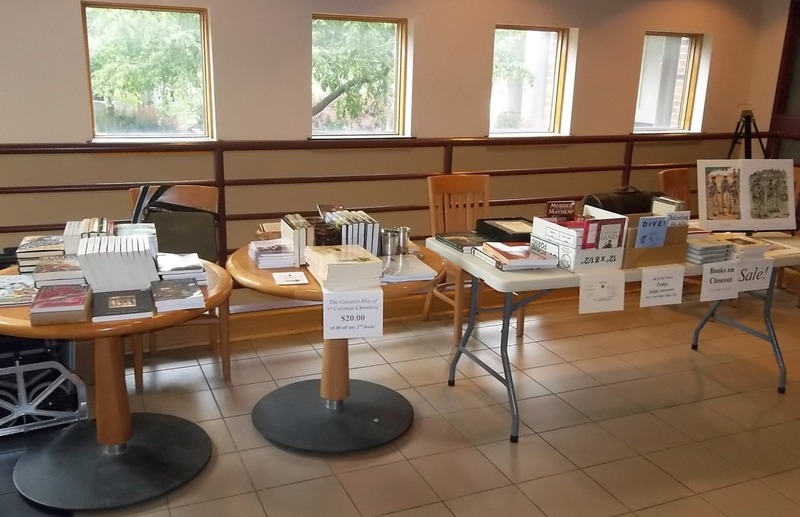 Most of these accounts have been gleaned from surviving veteran’s pension applications (submitted in the early 19th century) that have been codified on microfilm by the National Archives and Records Administration (NARA). 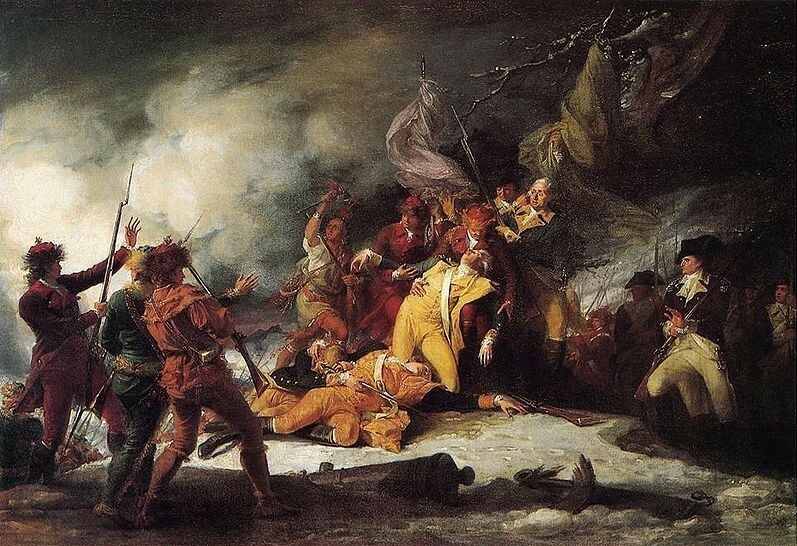 Despite what many historians believe, only a small number of their number would continue in the Continental Army after the disastrous Canadian Campaign of 1775. Beyond that, only a handful would serve until the end of the war. Among them was a private soldier who was captured by Indians while serving on the frontier. After being a prisoner for many years, he was freed by a French trapper near Detroit. From there, he had to find his own way home. Another was a talented but alcoholic officer. He was passed over, but was able to lobby and get position commanding a new infantry company. Unfortunately, that company was sent to Valley Forge. Still another former 2nd Yorker, an eight year veteran and escaped prisoner, served in five major campaigns during the war. He was wounded on three occasions by enemy fire only to have his widow’s survivor benefit claim rejected because of a paperwork error. 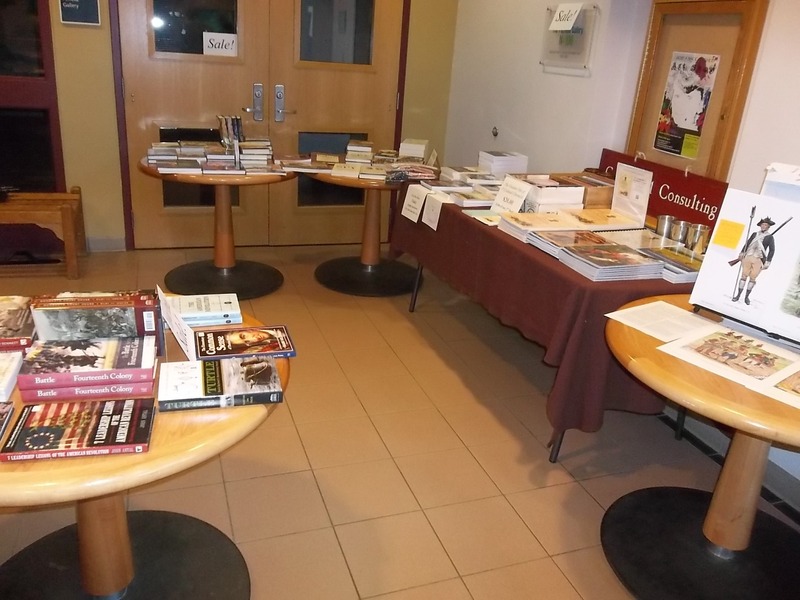 Attendees will be able to follow along with researcher and historian Phil Weaver and learn more of these and many other unique and fascinating men, plus the regiments in which they served. This is a long and detailed presentation. Despite being well received, it is far too long to complete in a reasonable time frame. Since it cannot be cut any further, the program is going to be beefed back up where it was cut-down and split into two separate programs later in 2018. 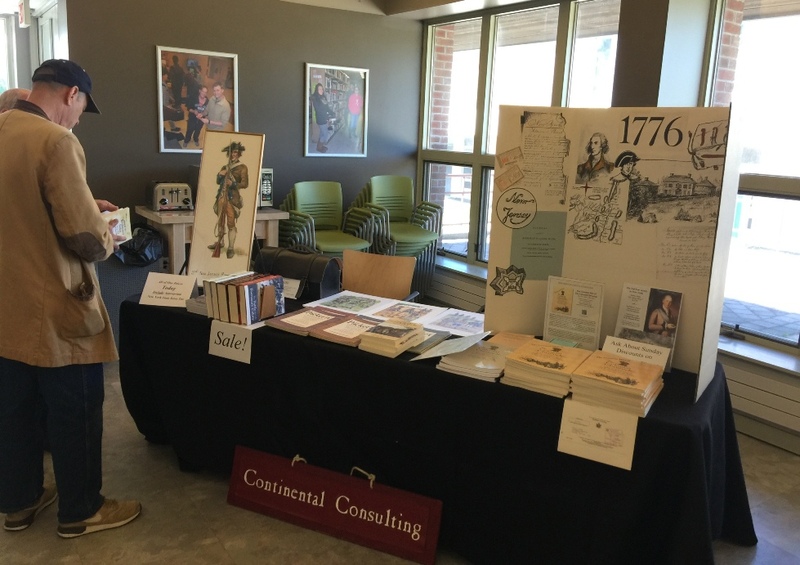 Attendees of this presentation will get a better appreciation of the personal stories of the officers and men of one of the best equipped and most interesting (and dysfunctional) regiments in the early Continental Army. 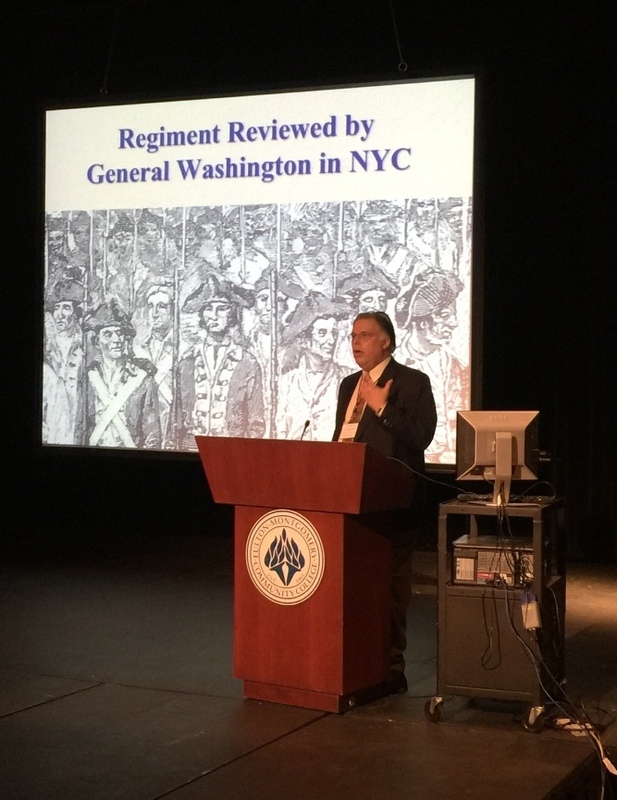 The program includes a quick introduction to the organization and the personalities of the regiment and a discussion of their New York campaign, including a number of specific incidents. 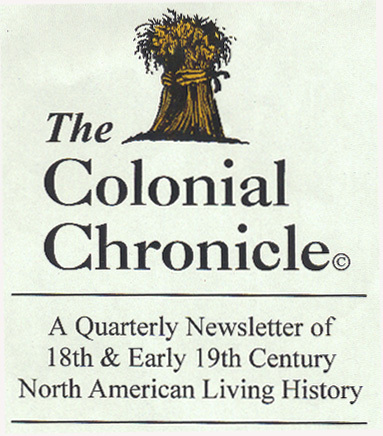 Information on the garrisoning of Fort Stanwix (which the regiment renamed Fort Schuyler), near present day Rome, NY, their subsequent relocation to “the old French Barracks” at Fort Ticonderoga in the fall of 1776, and the relief of the 1st & 2nd New Jersey regiments raised the previous year. 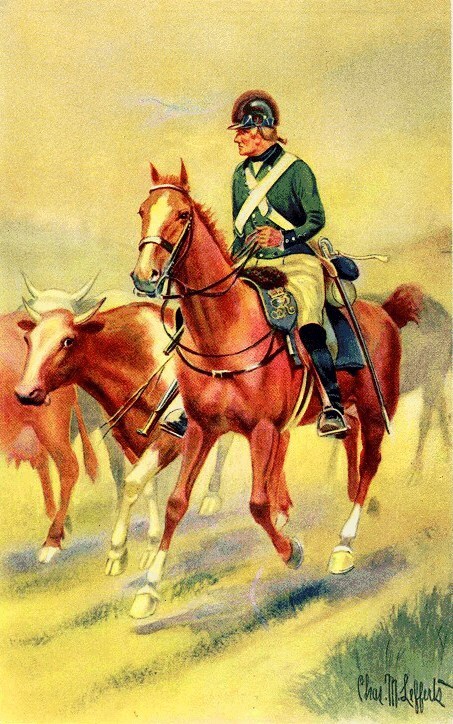 Samuel Wire, a young dragoon from Connecticut, was on a break from "hunting cowboys" when a door to a small house popped open. The green-clad Loyalist officer, who stood in that doorway, pointed his firelock and pulled the trigger! 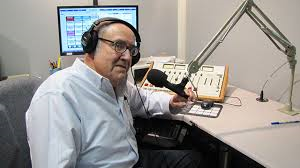 Follow noted Revolutionary War researcher and historian Phil Weaver as he explains how he discovered this remarkable story, the winding road he took to try and document it, as well as the fun and frustration of historical research. 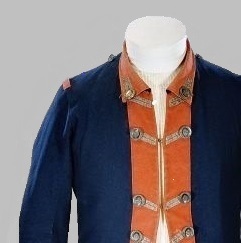 This "cloth talk" is a light and breezy, image heavy, discussion of the regimental coat owned by the Colonel-Commandant of Fort Schuyler (Stanwix), Peter Gansevoort "Jr." of the 3rd New York Regiment, who was acknowledged for his “bravery and perseverance” in leading its heroic defense during the siege of 1777. Attendees will briefly learn of this man's personal story (whose beginnings were as major of the 2nd New York during the disastrous Canadian campaign in 1775) and his iconic regimental coat that many of the "experts" initially believed to be some kind of an unknown odd-ball. In fact, they even thought it was German. Using photographs of extant garments, pattern elements, and period portraiture, Mr. Weaver will demonstrate the coat is actually indicative of one of several styles worn during the period. This program is basically the first half of the earlier The 2nd New-York Provincial Battalion: On Additional Continental Service presentation with additional material covering the transition from the intial regiments of 1775 through the winter of 1775-1776. It will be built around the unit history of the 2nd New York and the common experiences of its members. This Power Point presentation will grafically depict the detailed story published in the Journal of the American Revolution article of the same name. 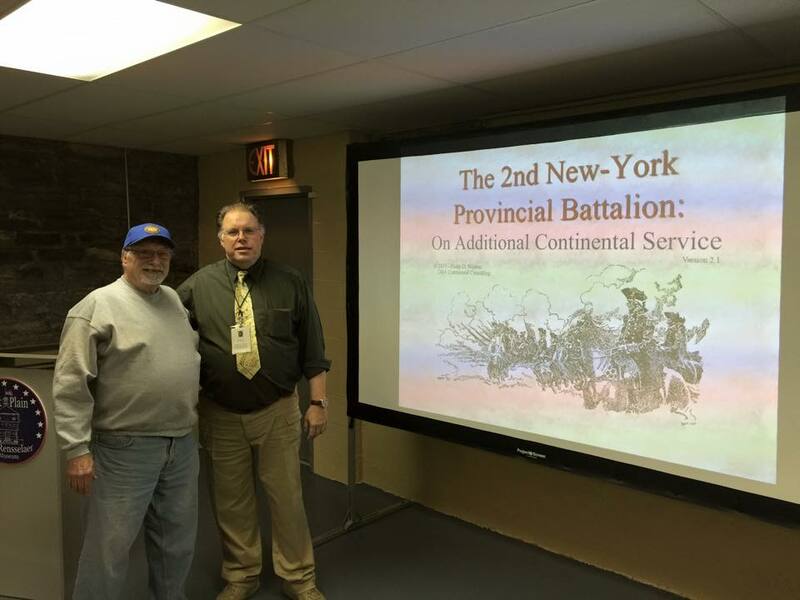 On Thursday evening, October 8, 2015, Phil Weaver (2NY) presented his The 2nd New-York Provincial Battalion: On Additional Continental Service program to an audience at the Fort Plain Museum in Fort Plain, NY. By discussing the different Continental Army establishments and the personal histories of members of the 2nd New York (ca. 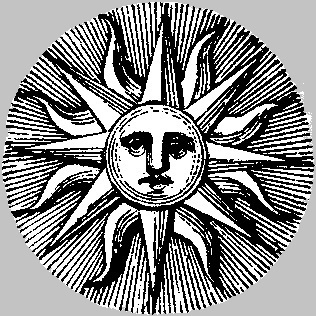 1775), this program disproves the commonly held belief that there was a direct lineage from one New York establishment to another. 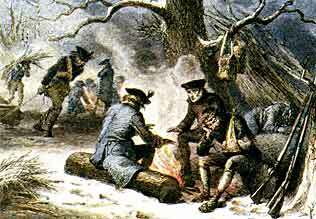 Also, there was only a small number of the original regiment would continue in the Continental Army after the disastrous Canadian Campaign and even fewer would serve until the end of the war. Mr. Weaver gave numerous examples of the detailed stories of these unique and fascinating men. A living historian for over forty years, Phil, a former Board-Member-at-Large, has been an active BAR member since 1979. 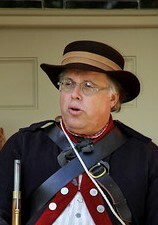 He joined the Company of Military Historians in 1980 and was elected a Fellow of the Company in 2004. This program is one a several that Phil has been presenting over the years through his business, Continental Consulting. 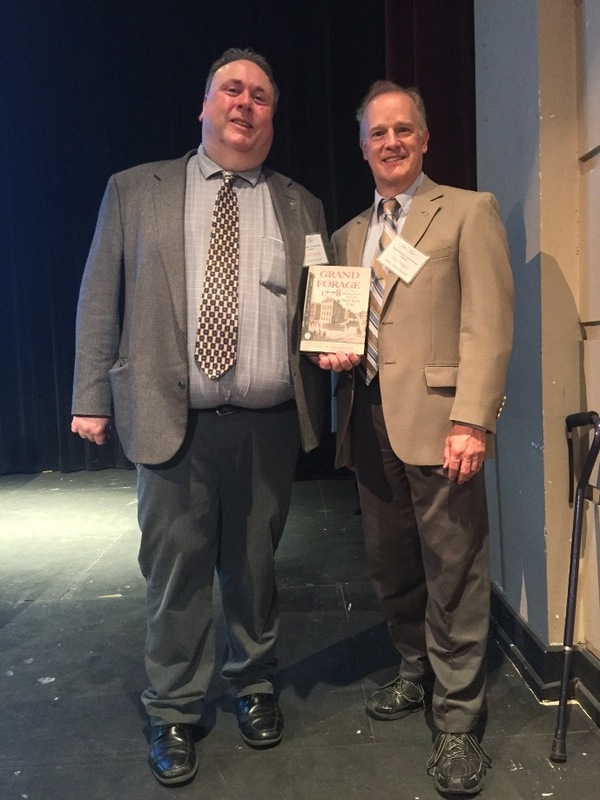 A great surprise was that BAR Founder, J. Peter Couser, was in the audience (see picture of Pete and Phil by Brian Mack, Fort Plain Board of Trustees). 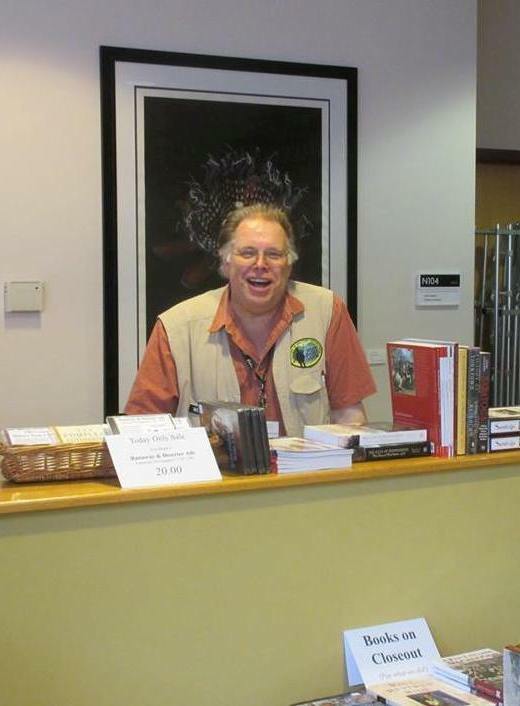 Pete now makes his home in Fort Plain and has been volunteering at the Museum for many years. 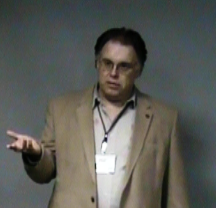 Assisting Phil, during the presentation, was George Warnecke (2ndNY) (not pictured) of Poughkeepsie, NY. 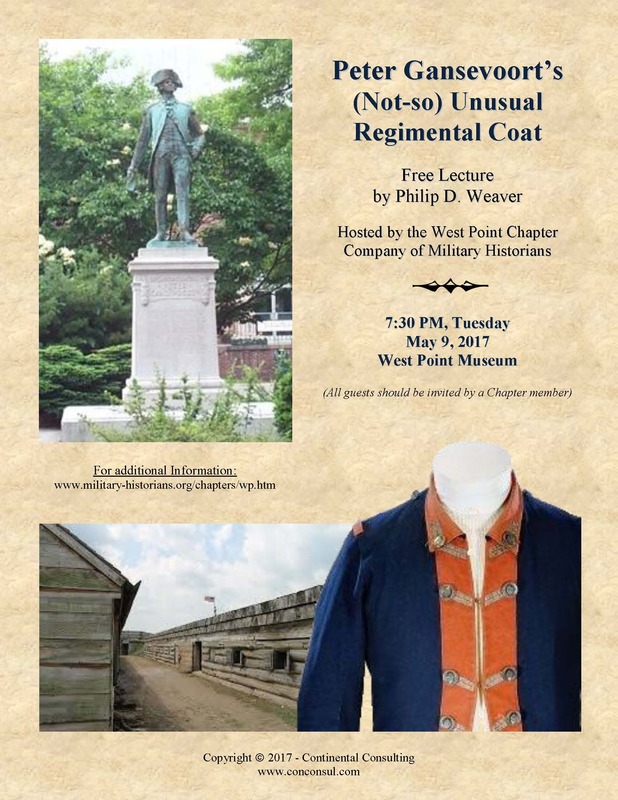 Phil Weaver, presented his findings regarding the regimental coat worn by Col. Peter Gansevoort during the American Revolution, at the May 2017 meeting of the West Point Chapter of the CMH. This was a relaxed and image heavy discussion of the man's personal story as well as details of the coat itself, which is now on exhibit at the National Museum of American History in Washington, DC. 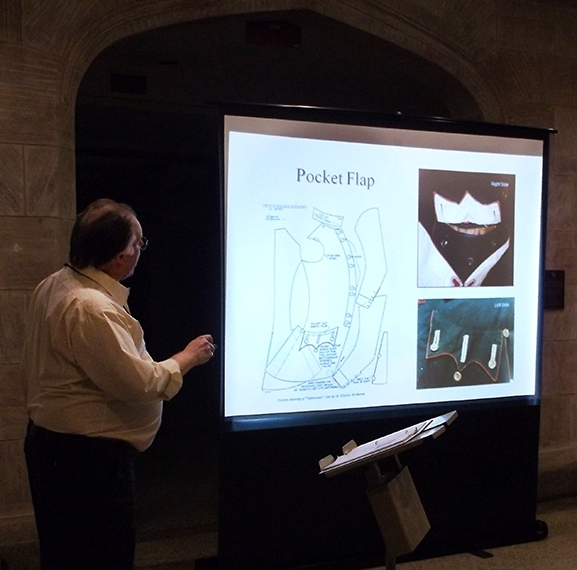 Using period documentation, photographs of a few of the remaining extant garments, pattern elements, and period portraiture, Mr. Weaver demonstrated the coat is actually indicative of one of several styles worn during the period and not the odd-ball many experts believed it was. Mr. Weaver has made presentations at such places as the Rensselaer County Historical Society in Troy, NY, the Fort Plain Museum & Historical Park in Fort Plain, NY, the annual CMH Convention/Meeting (2009) in Albany, NY, and has spoken numerous times for the West Point Chapter of the Company of Military Historians, countless schools and training sessions for the Brigade of the American Revolution. 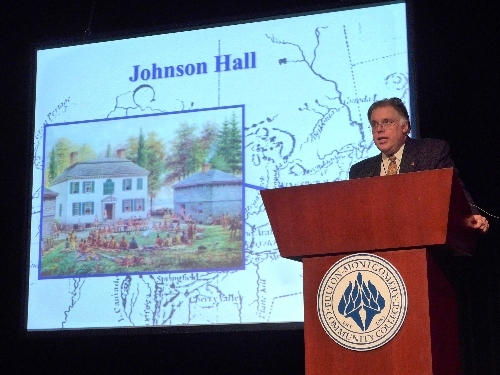 He has presented most of the above programs to, both, the Fort Montgomery State Historic Site, the annual Conference on the American Revolution in the Mohawk Valley, and the annual Fort Ticonderoga Seminar on the American Revolution. 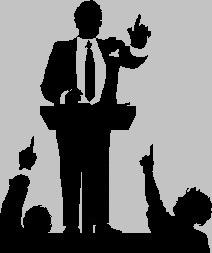 When possible, Continental Consulting provides a single advertising flyer announcing when Mr. Weaver is speaking for your historic and/or civic organization. These flyers are PDF files that are protected by copyright, but may be used for advertising or display by the organization that has contracted for a presentation. 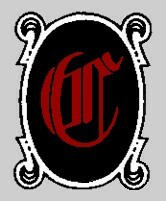 Continental Consulting also makes them available for free download here on this internet page. Several examples are linked below. All rights are reserved.